Made of a 4000-year old meteorite, the De Bethune Dream Watch 5 is no holds barred watchmaking that simultaneously remarkable and mystifying. 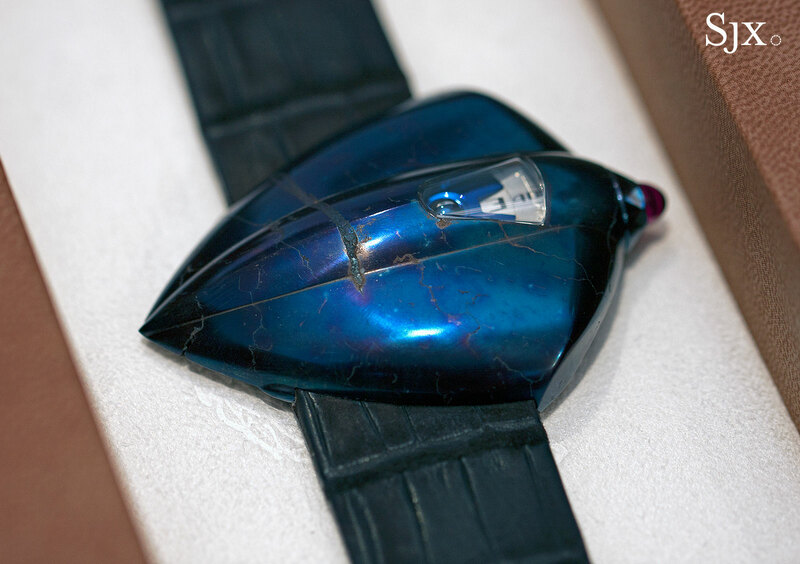 A wristwatch that is out of this world – literally – the De Bethune Dream Watch 5 Meteorite both awesome and shocking. 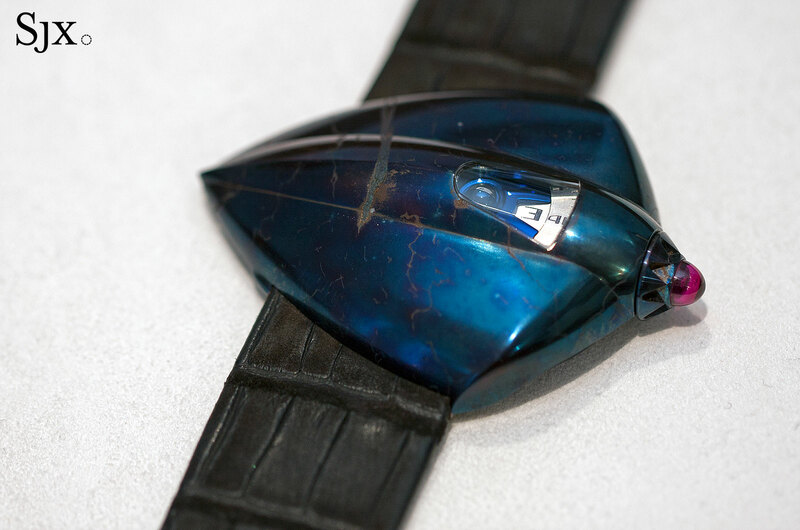 Awesome, because the wondrously blue watch case is remarkably fluid in form but milled from a meteorite, while containing a cutting edge movement with a tourbillon regulator. 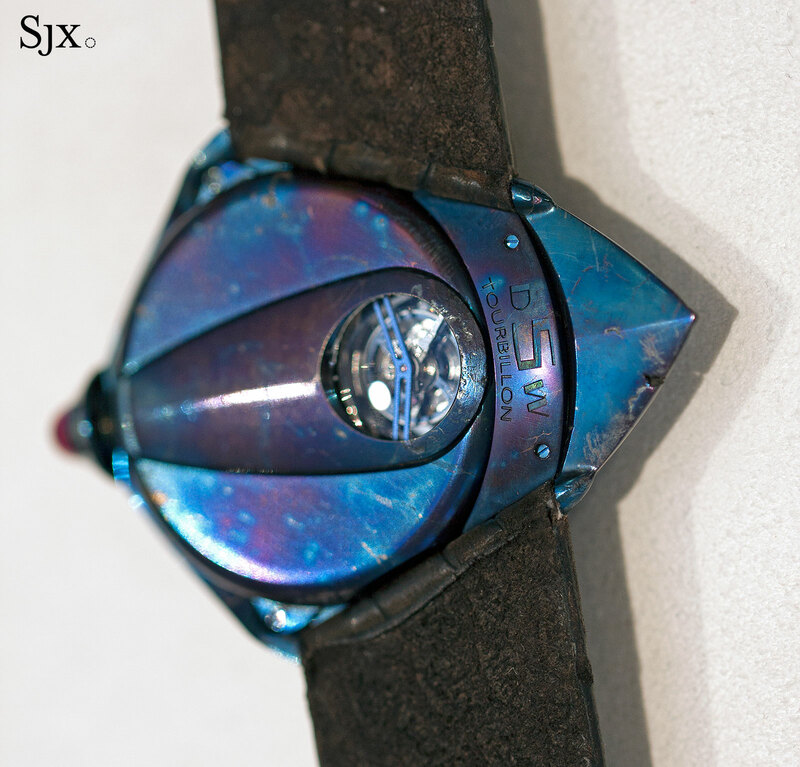 And it is shocking because the Dream Watch 5 costs almost half a million dollars. A one of a kind creation dreamed up by De Bethune co-founder David Zanetta, the Dream Watch 5 Meteorite is based on the first seashell-shaped Dream Watch, which was made of polished titanium but small in size. The latest Dream Watch is larger, measuring just under 50mm wide from tip to tip, and 39mm from top to bottom, but not overly so. In fact it feels rather compact on the wrist, helped by the sleekness of the case. The case material originates in Campo del Cielo, located northern Argentina. Translating as “Field of Heaven”, Campo del Cielo is a massive crater field that’s the result of a meteorite that impacted some four or five millennia ago. The largest meteorite ever found on Earth – it weight 600 tonnes before entering Earth’s atmosphere – Campo del Cielo was discovered in 1576. Since then some 100 tonnes of meteorite has been recovered, including a 3kg lump that was used for the Dream Watch 5 case. 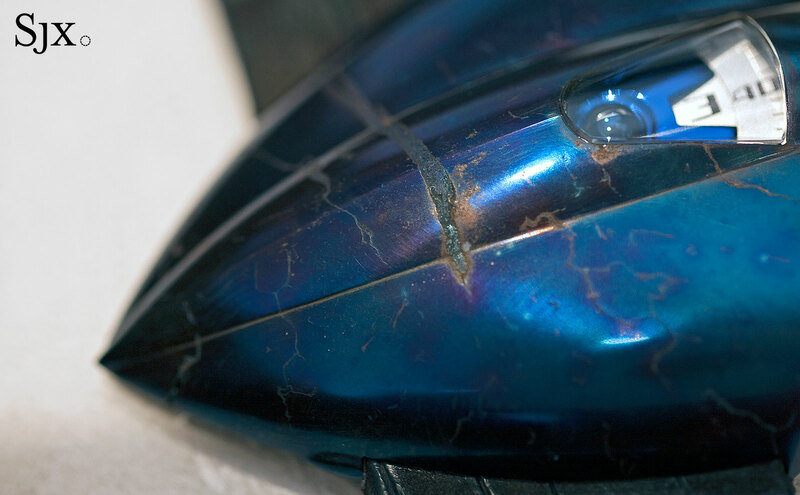 Composed mainly of iron, with small amounts of nickel, cobalt and other metals, the chunk of Campo del Cielo was machined into the case and case back, and mirror polished by hand. 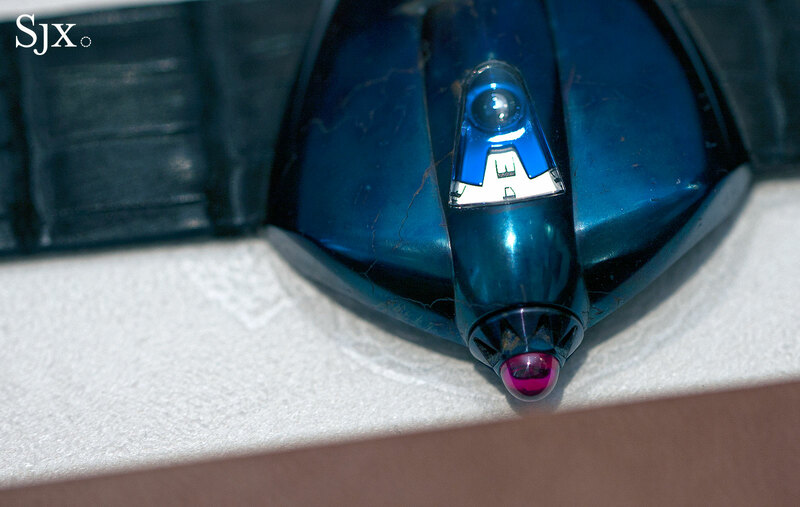 Then the case was heat treated to achieve the striking blue that’s typical of many De Bethune watches. Because the meteorite material is a non-homogenous, the colour of the case is shaded as various metals react different to heat treatment. The nuances continue with the fissures that interrupt the smooth surface of the case, contrasting with its sleek, rounded form. The crown is topped by a large, one-carat ruby cabochon, a lavish design accent in itself. But the red stone has been drilled out to accommodate a diamond inside for that extra bit of sparkle. This sort of detail that is hard to see and expensive to execute is typical of De Bethune, being both inexplicable and admirable. The Dream Watch 5 tells the time with a pair of discs, a jumping hours and sweep minutes. Small and somewhat hard to read – but in a watch this fancy who cares? 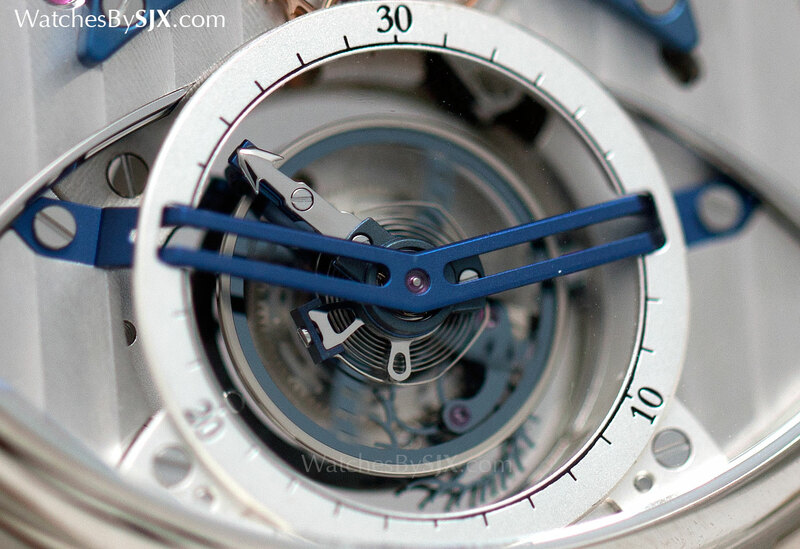 – they sit beside a blued titanium frame that contains the spherical moon phase display that’s a De Bethune trademark. The sphere is made of palladium and blued steel, each forming half the orb and pressed together. And like the time, the moon sphere is small enough that it’s impossible to make out the exact phase of the moon. De Bethune is responsible for some of the most high-tech mechanical movements on the market, and the Dream Watch 5 is no exception, though the DB2144 inside is an existing one. Hand-wound with a lengthy six day power reserve, the calibre DB2144 is almost identical to the that in the DB28 Digitale, except the Dream Watch is also equipped with a high-speed, high-frequency tourbillon regulator that visible through a porthole on the back (the same tourbillon that’s found in several other De Bethune wristwatches, including the DB25T Zodiac). Making one revolution every 30 seconds – conventional tourbillons do the same in one minute – the balance oscillates at 36,000 beats per hour. To do that the tourbillon cage is made of silicon and titanium for lightness. And the balance wheel is made of silicon and white gold, while the escape wheel is silicon. The liberal use of silicon is intended to improve timekeeping since the material is light, nearly friction-free and manufactured to extremely fine tolerances. In fact, De Bethune is the only small scale independent watchmaker – the annual output is just 200 watches or so – that uses silicon so widely in its movements. That is not cost effective since silicon components are only economical on a large scale due to the high-tech etching process required to make them. A tremendous amount of effort and thought has been put into conceiving the Dream Watch 5, from the meteorite case to the movement inside, that much is obvious. And relative to the competition De Bethune is still making some of the most ambitious, unusual and imaginative mechanical watches on the market. But the Dream Watch 5 is still a whopper, priced at SFr450,000 before taxes, equivalent to US$459,000. 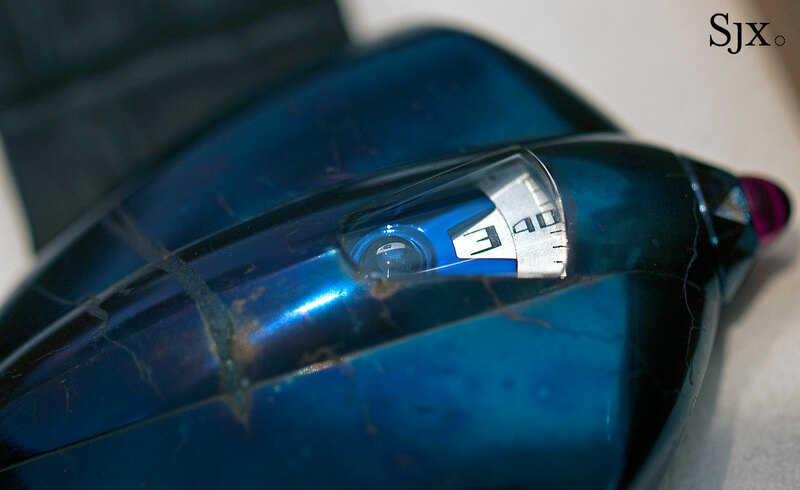 A look at De Bethune's high speed tourbillon with deadbeat seconds.